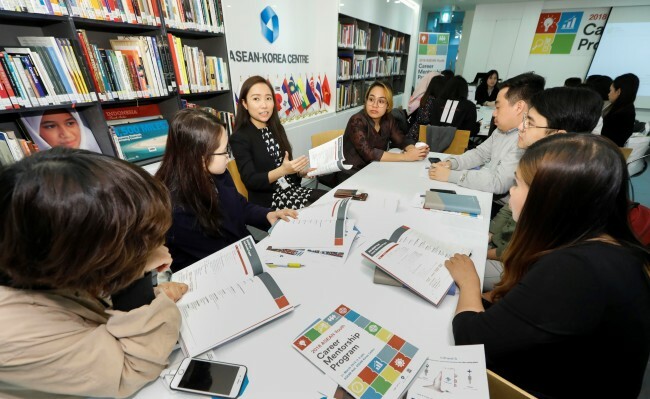 The ASEAN-Korea Center in Seoul organized a career mentoring seminar on March 31 to help Southeast Asian students get started in Korea’s competitive, yet promising job market. Some 80 students from the Association of Southeast Asian Nations participated in the event, where information on applying for jobs, such as writing an effective curriculum vitae, resumes and cover letters, as well as tips on answering interview questions, were provided. “The number of ASEAN youths studying in Korea continues to grow, reaching some 20,000 last year. As Korean companies are increasingly expanding their businesses throughout ASEAN markets, those familiar with the Korean culture and language are sought after as links between Korean firms and their trade and investment partners in ASEAN,” said Jang Yeun-ju, acting secretary-general and head of the information data unit at the ASEAN-Korea Centre. The first session was followed by a lecture by an immigration lawyer on procedures and requirements for obtaining work visas here, which remains a major hurdle for job seekers from Southeast Asia. Finally, the participants chose a topic among business and finance, engineering, government and nonprofit, and science and research, and listened to mentors speak about their experiences in job hunting, application and working at Korean enterprises. “As the partnership between ASEAN and Korea becomes ever more important with the Korean government’s ‘New Southern Policy,’ aimed at strengthening ties with Southeast Asian and South Asian countries, our center has attached great importance to our programs to support ASEAN youths,” said the organization. The program is among a wide variety of events organized by the center to aid students from ASEAN. The institution will organize three more events this year: the ASEAN Youth Startup Development Workshop in May, ASEAN Youth Film Festival in September, and ASEAN-Korea Youth Year End Celebration in December. Meanwhile, the center has launched a monthly magazine, titled “ASEAN Talks,” which offers the latest information on and in-depth analyses of ASEAN and its member states. The magazine is written by the center’s program officers, who are familiar with the inner workings of the diverse, complicated association of nations through hands-on experiences. The inaugural March edition shares insights on Myanmar’s investment climate, laws and challenges for foreign investors. The magazine is also available at www.aseankorea.org as well as the center’s social media platforms and newsletter.